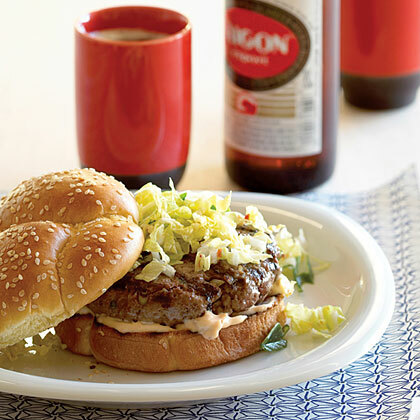 Mix cabbage, 1/4 cup green onions, the vinegar, 1 tsp. each garlic and ginger, 2 tsp. sesame oil, and 1/2 tsp. chili sauce in a large bowl. Set relish aside, stirring occasionally. In another bowl, mix mayonnaise with remaining 1 tsp. chili sauce. Combine beef, soy sauce, and remaining 1/4 cup green onions, 1 tbsp. each garlic and ginger, and 1 tsp. sesame oil. Shape into 4 patties, each about 1/2 in. thick. Oil cooking grate, using tongs and a wad of oiled paper towels. Grill burgers, covered, turning once, 7 to 8 minutes total for medium. In the final minutes, toast buns. Spread bun bottoms with chili mayonnaise. Set burgers on buns. With a slotted spoon, put some cabbage relish on each. Serve with remaining relish. Shortcut: Omit the relish and use kimchi from the refrigerated section of a supermarket or Asian market; the recipe will be saltier.